The term &#147;screwball comedy&#148; is one of those genre labels that, like film noir, seems to be applied as loosely as it is frequently. Once upon a time, &#147;screwball&#148; denoted a very specific type of film from a very specific moment in time — that strain of comedy from the &#145;30s and &#145;40s characterized by fast-talking females, breakneck pacing and an all-around kookiness of character. These days, however, the concept of those speed-fueled farces has become interchangeable with the broader historical category of &#147;romantic comedy,&#148; a catch-all name for any film that included both lovers and laughter. Worse, many critics and scholars tend to lump the two together without distinction, hailing most battle-of-the-sexes farces with semi-witty banter and a flirtatious lead as the cinematic equivalent of a Dizzy Dean pitch regardless of conventions. Even one of the genre&#146;s definitive tomes, James Harvey&#146;s eloquent Romantic Comedy in Hollywood, refers to the Golden Age&#146;s giddy gems as &#147;romantic &#145;screwball&#146; comedies&#148; as if they were one and the same. The fact of the matter is, while both categories do occasionally overlap in the narrative and casting departments, typical &#147;rom-coms&#148; and traditional screwballs are as different from each other as a filet mignon is from a Filet O&#146; Fish. Each come to screens with their own stylistic and thematic concerns, each seek to draw distinct reactions from audiences, and each view the real/reel world through discrete kino-eyes. Yet endless questions rear their heads whenever studies attempt to establish beginnings and endings, common ground and kindred spirits: How does an auteurist deal with, say, Leo McCarey, who made both the screwball template The Awful Truth and then proceeded to direct the archetypal romantic comedy Love Affair two years later? Why shouldn&#146;t they be considered filmic birds of a feather? And where exactly do their roads diverge? Into the fray steps Wes D. Gehring&#146;s Romantic Vs. Screwball Comedy, and lest anyone think that lines won&#146;t be drawn into the sand, the book is subtitled &#147;Charting the Difference.&#148; Gehring begins his study by taking each genre apart piece by piece, proposing that both should be dealt with as separate entities unto themselves. Better yet, he outlines exactly how each differ in detail, i.e. screwball&#146;s propensity for cynicism vs. romantic comedy&#146;s penchant for sentimentality, screwball&#146;s emphasis on comedy over coupling vs. romantic comedy&#146;s love-conquers-all ideology. The mapping of disparate parts for each film styles’ sum totals would seem the perfect starting point for mounting a much-needed revision of some old warhorses, and indeed, a few sacred cows get poked and prodded. It&#146;s a relief to finally see someone take the bold move of declaring that the ground zero of screwball, Frank Capra&#146;s It Happened One Night (1934), isn&#146;t really a screwball comedy at all but a romantic comedy, explaining how the film is a pitch-perfect rendition of the latter and backing up his argument by checking off its genre elements one by one. one can chalk it up to one reader&#146;s disappointment regarding personal taste. But to refer to Runaway Bride (1999) or Notting Hill (1999) as screwballs stretches even the wildest of imaginations, especially when they fit the author&#146;s own notion of what a makes a romantic comedy almost to a tee. Even with his myriad of rules, it&#146;s impossible to see how Gehring can defend some of his categorization. success that became a must-see picture for film lovers everywhere!&#148;, or the pulp-ed out prose that christens Dudley Moore as &#147;an undersized comic Hamlet.&#148;). 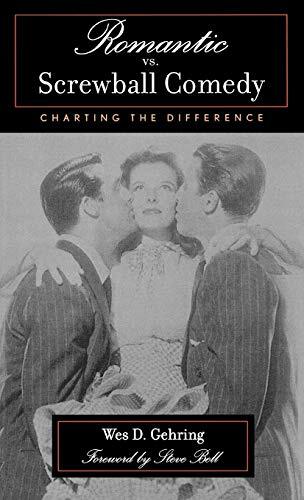 A chapter on Cary Grant and the recently departed Katharine Hepburn, while offering a brief overview of connections to both genres, adds nothing to th4e conversation whatsoever. The use of quotes from period reviews is a typical journalistic standard, yet here the overuse of notated material merely courts redundancy over enlightenment. When discussing character actress Maria Ouspenskya&#146;s contribution to establishing a romantic comedy trademark, does the fact that a New York Post critic felt that &#147;[her role] will be remembered when parts ten or twenty times as big have been forgotten&#148; really add anything to the point? In the book&#146;s epilogue, the author speaks of having an epiphany upon hearing a theorist quip that &#147;a genre that encompasses the visions of Jerry Lewis and Ernst Lubitsch is already in trouble.&#148; One could say the same thing about a genre that counts both My Man Godfrey and Micki & Maude amongst its ranks, an irony I&#146;m not sure Gehring is aware of. Such quirks, odd choices and unintentional hilarities would be forgivable if one really felt like a template for both comic stylings had been set. The idea of detailing once and for all the basic building block elements of both romantic comedy and screwball, as well as their social significance, is certainly a ripe one, and perhaps one day someone will do the subject justice. Yet after reading this Gehring&#146;s pas de deux attempt at setting a standard, the waters seem even muddier. One puts this book down, or throws it away from oneself in frustration, less sure of anything except the fact that the good professor should refrain from further alleged elucidations on the subject.